Backlinking is often lauded by many in the SEO industry as a godsend to small companies and business websites hoping to extend their outreach. It has been praised by industry stalwarts such as Neil Patel, Brian Dean, John Jantsch and Rand Fishkin for increasing the keywords’ rankings of websites and improving overall traffic, and continues to be one of the main aspects of excellent SEO services. 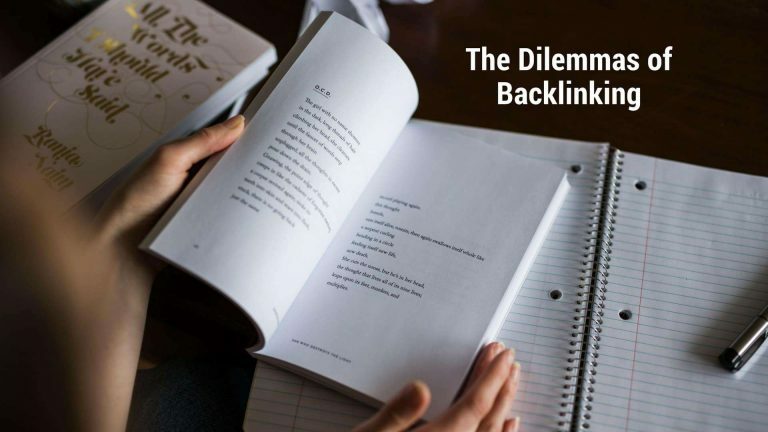 However, sometimes it might be better to understand that there are also downsides to using Backlinks, which can be caused by misuse of backlinking practices or just poor backlinking in general. So what exactly are Backlinks? Simply put, Backlinks are links from other websites to a website. This means that the links have to be from external sources(not from internal links). Essentially, Backlinks are useful for a few reasons, mainly related to improving website viewership and forming connections across the internet. First, Backlinks provide reputability. Much like Academic references and citations, having another website link to your website is a mark of respect and acknowledgement of quality. It is a symbol that people from other websites – content creators or marketers such as yourself – vouch for and acknowledge the benefits of your content. Hence, it is usually a prerequisite to have good, useful content before others will see the need to provide backlinks to your website. Go to any of the top websites in their niche and you will find that many smaller websites feed links from these larger websites giving them backlinks(and in return some links also go the other way). This allows the larger website to gain more credence, but also helps the smaller websites grow their audience. As the saying goes, “All Roads Lead to Rome”, and with high quality backlinks it is no different, you just need to find your own way. Second, Backlinking can grow your websites’ viewership phenomenally. Backlinks cause Google’s search algorithm to favour your site, as it is indexed on other websites and hence shows up more frequently. Additionally, this allows your site’s CTR and visibility to increase due to the increased awareness that your site exists based on links provided by other, more reputable websites. In Brian Dean’s well-documented “Skyscraper Technique”, he explains how a website’s traffic can be improved by 110% just using the power of Backlinking alone. Finally, Backlinks are a good way to form connections with other entrepreneurs and web content creators over the internet. As the main form of obtaining Backlinks is to ask nicely via email or any other internet messaging platform, good communication skills are essential to forging connections with other website owners. As mentioned, one must first have access to quality content before reaching out to prospective referrals. If done correctly, a good relationship between two websites can be achieved, where both websites benefit from each others’ backlinks. Additionally, growing your base of connections improves your reputability in the online world, cycling back to the previous point about Backlinks improving stature. As always, too much of a good thing can be a bad thing. In the case of Backlinks, there are a few ways to screw up all the hard work you’ve put into your website. In the SEO world(much like internet security), there are “good guys” and “bad guys”. The “good guys” are known as White Hats and the “bad guys” are known as Black Hats. White Hats use honest, trusted methods to improve SEO such as improving content, proper backlinking and use of keywords, while Black Hats use keyword spam, buy backlinks, create doorway pages(SpamDexing) and invisible text, which is unethical. Using Black Hat methods to improve your website may work in the short run, but in the long run it is more damaging than one could possibly imagine. If detected, Google will cause your website’s ratings to decrease in favorability, leading to the opposite of what was intended. Rule of thumb: Don’t buy backlinks, especially from shady sources. Instead, use organic methods of backlinking to boost SEO rankings. In Backlinking, a specific term known as Anchor Text exists. Anchor Text is basically the clickable text in a hyperlink. Anchor Text is one of the various signals that Google uses to analyse the content of a website. When using Backlinks, one must take care to use proper Anchor Text, or risk not having fully optimised Backlink potential. Additionally, there lies a risk in over-optimising Anchor Text, as Anchor Text is can be classified into Exact Match Anchor Text and Non-exact Match Anchor Text. Exact Match Anchor Text is anchor text that matches the content of the hyperlink completely. Having too much of those can make your website appear like a bot site or spam site according to Google’s algorithms, penalising your website in the process. This is because organic backlinks often have naked urls or non-exact anchor text, and having none of those can be suspicious to a web algorithm. Rule of Thumb: Find the right balance of exact Anchor Text and natural Anchor Text when optimising hyperlinks, and be sure not to spam keywords. It is always better to check the quality of the websites that you backlink from as domain authority matters. A backlink from a lower quality website does not hold as much worth as one from a website with high domain authority. This is somewhat related to the previous point about Black Hat practices. As shady websites often have terrible non-user-friendly practices, avoid those sites. To check on a website’s domain authority, use SEO Site Tools, and choose websites that have a higher domain authority to backlink. To sum it all up, Backlinks are an SEO specialist’s best friend, but they can also be their worst enemy. In essence, to fully realise the potential that backlinks have to offer, one must use ethical, organic methods to boost SEO rankings and interact kindly with the website owners in order to foster communication and growth. Using unethical methods such as buying backlinks or spamming keyword Anchor Text is not only unprofessional, but harmful for the website’s long term growth. This means that lots of hard work is required to build good backlinks. This includes creating high quality content, finding a list of reputable sites to link from and constantly monitoring your site’s metrics to find the right balance. Hence, Backlinking should not really be a dilemma – it may not be essential to a website’s SEO but it really helps. The difference between a website with no backlinks and a website with great backlinks is like comparing a paper plane to a jet-fueled rocket – there is simply no reason you shouldn’t attempt to form quality backlinks. Even if you fail(initially), there’s no harm done in trying to get you quality content out there. So what are you waiting for, start backlinking today!